"Fiat Chrysler has designated the city of Detroit as its first choice as the first auto assembly plant in built in US in more than a decade," Mayor Mike Duggan said. 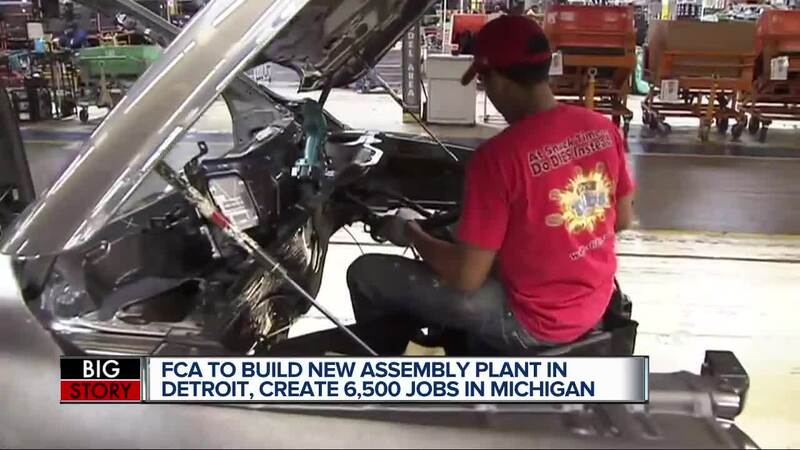 DETROIT (WXYZ) — Fiat Chrysler announced Tuesday it will build a new assembly plant in Detroit, along with investing in five existing Michigan plants. The move will create 6,500 new jobs. The total investment in the Michigan plants has reached $4.5 billion, according to a press release. Fiat Chrysler says the new investments are aimed at increasing capacity to meet the growing demand for trucks and SUVS, focusing on its Jeep and Ram brands. The new plant will be built within the Detroit city limits. Detroit Mayor Mike Duggan, Governor Gretchen Whitmer and Wayne County Executive Warren Evans have called a press conference today at noon to talk about a historic job announcement for Detroit. It’s speculated that they will announce the new Fiat Chrysler plant built within the city walls of Detroit.